Is there possibility to change the distance of the corner/panel when glow is triggered? As now the panel glow trigger distance is way too short and it is more just a bullet in the feature list than visual feature. Like getting a setting to get max a 200-300px distance for trigger would make it much better visual aid. Not with X 🙂 It would be too much overhead to track a 200-300 pixel wide area. Once we are on Wayland it would be possible but I think it’s too large. So, that strange problem with this button, which sometimes appears on screen while changing desktops, after having used “present windows” could be just because of that? I guess I should fill a bugreport? Yes, sorry, I misread the title. I though it was the bug that closed windows remained in Task Manager plasmoid. but it has been marked as duplicate of the one you pointed. Thanks. no I think that’s unrelated. We have no idea for that bug (it is reported) and don’t know how to trigger. Using mouse hover events for triggering changes in GUI state is a hideous concept and does not translate to touch devices (unless you use Android on a S4 with it’s front facing camera) so please please try to enable alternate mouse button click detection for corner/edge related GUI state changes. screen edges are for mouse driven systems. If you use touch screen edges won’t be available. Whether screen edge detection is available on a touch device is besides the point, as far as I am concerned, activating GUI state changes via hovered mouse events is a completely broken and unusable paradigm. I, and the clients I support, have to disable all such behavior because the number of times it misfires and interferes with the users focus far out weights any possible convenience. the feedback we get doesn’t indicate that users have a problem with it. Perhaps if the users you speak of had an alternative to hovering activations to compare with then they may prefer those alternatives. ATM it’s hover or nothing and every single person I know of, even on windows with the bottom panel, who has tried hovering events and thought it was neat to start with ended up disabling it. I am not clear what you are proposing as alternative methods. Being able to use all 3 mouse button clicks in the corners and edges to activate actions. Perhaps even in combination with meta keys but I don’t care about that. I want to specifically be able to use the RMB in each corner and edge to do what currently is done with just hovering the mouse pointer alone. Ie; move mouse to bottom edge, click RMB, and that raises the hidden panel and it stays visible until I specifically dismiss it with another RMB click. But clicking on the screen using LMB or RMB is already used for other things. For example if you have a maximized window, moving the mouse to the top right screen corner and clicking the LMB closes that window. Also, note that the current screen corner/edge activation does not respond to simple “hovering”, it responds to moving the mouse to the screen corner/edge followed by *pushing* it further in that direction. That’s not that different from your suggestion of moving it there followed by a click, except that it does not interfere with the normal click handling of windows and window decorations. > move mouse to bottom edge, click RMB, and that raises the hidden panel and it stays visible until I specifically dismiss it with another RMB click. Wrong component, that’s plasma-desktop, not kwin. You’re suggesting https://bugs.kde.org/show_bug.cgi?id=300008 and tbh, that bug is likely born out of the “i get my mouse out of sight by moving it out of the screen” disease which then likely stems from the MS world and is about the most stupid solution to a problem i can think of. If you want to hide the mouse, just do that. The proper solution is however to make the application where the mouse is in the way hide it. If you worry about touchscreens: don’t. When you push them in a random position you’ll get the required crossing events for free. What does not work in the kwin case is the pushback, which is however configurable. Finally: you’re still free to deactivate all electric borders and place your click accepting windows there. But here’s a good hint: if you allow random and pot. destructive actions by clicking into some invisible space, you’ll find yourself in trouble soon. What hover-triggered GUI changes do you mean, exactly? If you mean the blue glow, that isn’t really a feature in a functional sense, it’s a non-obtrusive and completely non-critical indicator, a.k.a. “eye-candy”. I don’t see why it should not be triggered by hovering. If you mean the sliding panels and the “Show Desktops” and “Show Windows” effects themselves, then your assertion that users aren’t given a choice in how to activate them is wrong. Panels can be set to ‘always visible’ (the default panel already is), and the desktop effects can be activated using keyboard shortcuts. For example, when I set up KDE for someone who uses a “multimedia mouse” with 7+ buttons, I tend to map the “Show Windows” effect to the lower thumb button (using xbindkeys + xte), that’s usually quite well received. But if such a mouse is not available, I personally don’t mind activating it through the screen corner, either. Replying to smls, the current replies are becoming unreadable. Of course but there are 8 very special 1px areas in 4 corners and on 4 edges that are “global” to every desktop and easily calculated (ie; top-left is 0,0… done) and the Electric Borders(?) code would already cover this. All I am suggesting is that when the mouse pointer is a 0,0 that it does not activate anything (unless the user wants it to) until a mouse button click is ALSO registered and that event is then trapped. If trapping the mouse click event involves putting an extra invisible window above the whole desktop that does nothing except (optionally) trap mouse button clicks in the corners and edges then so be it. When I currently use hover to raise a panel, on any edge, it does not require a “push into” the edge to activate. Not that I can perceive anyway. The corners, yes, but very subtle and now that I use the Title Bar Button menu style on maximised apps I find the current top left screen edge mouse position detection (okay, “hovering” is not correct) simply misfires far too often to be useful (for me). a) if I could RMB (or LMB/MMB) in each corner then I would have far more precise control over when the action gets fired. b) if the available actions also included “Other”, such that I could define a command or dbus action as well as the current pre-defined options, then the number of possibilities and overall functionality of using edge/corner detection would be almost unlimited. You can already do this using the ‘xte’ tool from the ‘xautomation’ package, which most Linux distros should have in their repositories. For example, by default the “Present Windows (Current desktop)” KWin effect is mapped to the Control+F9 keyboard shortcut. You could execute this command from wherever you like, for example you could set up xbindkeys to automatically execute it when a special mouse button is pressed. Or you could script a simple Plasma applet with a button that executes the command. Or even try to implement your “invisible window” idea (even though I personally still think it would interfere with the normal functions of the left and right mouse button). 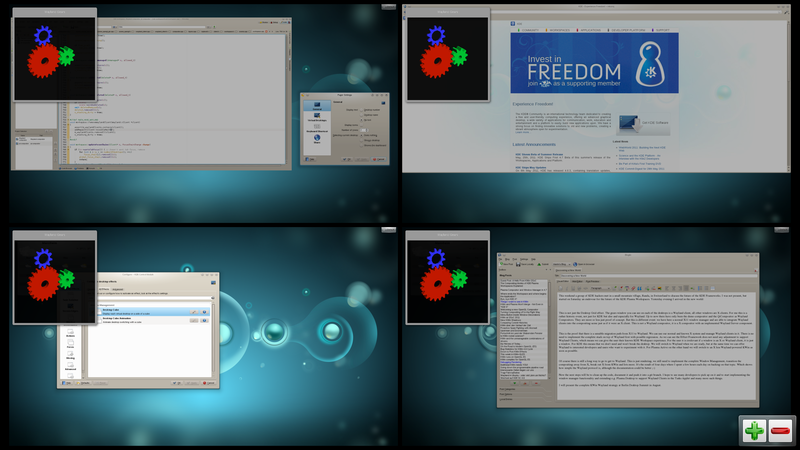 Yes, I’ve tried a few “hacks” over the years and the closest solution was pekwm which almost does what I want except it did not have the 4 corner hotspots, and it’s a long way away from the qt/dbus/kde/kwin world. Thank you for great work on kwin! I am especially excited about the changes made in terms of qml (Desktop Grid, the screenshot you provided). Is it possible to compile and test those changes now? Could you point me to the source? I am afraid it involves recompiling plasma, right? Or, as I am a Opensuse user the KDE trunk repositories should already contain this fixes, as I suppose the mentioned changes have been merged. I don’t know how fast openSUSE is with packages for master. It got merged this week. Great job Martin and partners, since I was discover KDE (not really a discover), I cant use any other desktop enviorment, they looks like stones, boxes and other ungraceful things. Thanks for all and keep doing this excenlent work. From Cuba, best regards.